Julie Made This: Did someone mention mittens? As mentioned in a previous post, with Christmas knitting finally out of the way (for the moment at least) I've been focusing on projects for either Dave or myself. The lace shawl is continuing to come along slowly, now standing at 208 rows and I've been working on smaller portable and easier projects alongside it. I decided to have my first go at gloves or more specifically fingerless mittens picking something for Dave first. These are 'Dashing' from Knitty which I started at the end of November and finished a few days before heading down to Devon for our seasonal visit. They're knitted in larger size even though Dave's not a large bloke, mainly because I preferred the look of the cables. 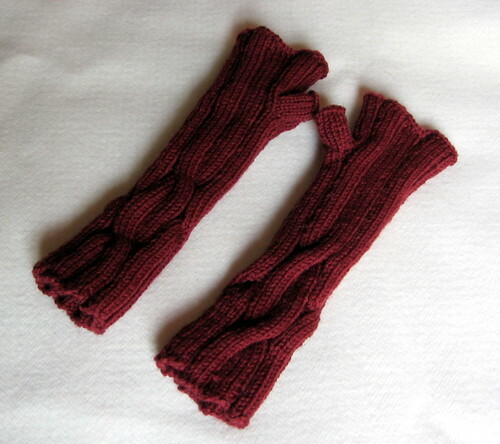 These gloves were a doddle to knit and a relatively quick knit, which was just what I was after. I used the best part of a skein of miscellaneous aran weight from my stash, picked up as sale yarn a couple of years ago. The colour is great and for an unknown wool mix, the yarn handled well while I was knitting it. Even better, Dave loves them. The only thing I wasn't sure about was the thumb. The thumb hole is initially worked in a waste yarn, which is later ripped out and the resulting loops picked up to be worked as stitches, forming the thumb. In this case, this meant the thumb ends up looking like it's been tacked on as an after thought, or at least it does while the gloves aren't been worn. Once on, the gloves look very good, so perhaps it's just me fretting and being overly fussy. Don't take this the wrong way but my first thought was socks without ends and my 2nd thought from the next photo was trees. I do think they look nice though, but think I prefer the sort with individual fingers, which I imagine are a pain to knit.